Social events are a large part of the OFRC Club experience. Members can interact, network business contacts and fellowship with a wide range of activities. Family Socials include; Memorial Day BBQ, Summer Shrimp Boil, 4th of July Celebration, Fall Pumpkin Palooza and our Fall Oyster Roast. Other family socials including pool parties, spaghetti dinners and bingo night are hosted throughout the year. Kid friendly socials include pool parties for elementary and middle school, annual Easter Egg Hunt event, movie nights, late night swims and much more. Our adults can enjoy a variety of social events including; Valentines Social, Margarita Night, Casino Night, New Member Mixer, Fiesta by the pool as well as our annual AJTF Charity event and For the Love of a Cure cancer tournament. Lounge Rental: The OFRC facility can host your next wedding reception, anniversary dinner, birthday party or family reunion. Our 2000 square foot lounge is flexible enough to change from a formal occasion to a kids birthday bash. This multipurpose room comes complete with a kitchenette (sink, microwave and refrigerator), large screen TV with DVD player and stereo system. Please contact the club manager for more information or to make a reservation. 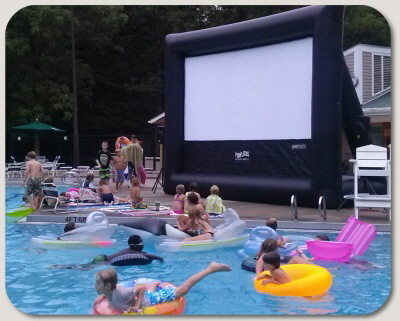 Pool Shelter: The #1 place to host your child's next birthday bash, sport team party or back to school event!! A 2 hour reservation allows you to include 25 friends for only $40 in our sheltered party area complete with picnic tables. Please contact the club manager for more information or to make a reservation.